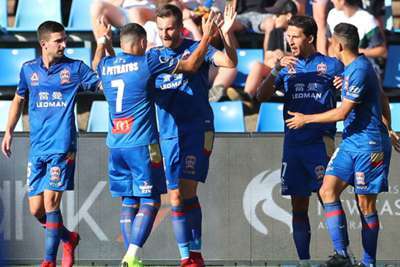 Newcastle Jets recorded their fourth straight win over Brisbane Roar with a 2-0 victory in the A-League on Sunday. Kaine Sheppard and Jair scored their first A-League goals as the Jets continued their recent dominance over Brisbane. The win lifted Newcastle into sixth place in the table, while Brisbane dropped to ninth after just one victory in seven games this season. The Jets could have fallen behind in the first half, but goalkeeper Glen Moss made a stunning save to deny Eric Bautheac. Instead, the hosts went ahead in first-half stoppage time, Sheppard putting away Daniel Georgievski’s cross from the right. Newcastle doubled their lead just before the hour-mark through Jair, who found the net for the first time since September 2017. Dimitri Petratos played in the Brazilian and Jair finished beautifully into the roof of the net to continue Brisbane's early-season woes.